The first use of the term coaching to mean an instructor or trainer arose around 1830 in Oxford University slang for a tutor who "carries" a student through an exam. Coaching thus has been used in language to describe the process used to transport people from where they are to where they want to be. The first use of the term in relation to sports came in 1861. Historically the evolution of coaching has been influenced by many fields of study including LGAT such as "est", personal development, adult education, the Human Potential Movement, psychology, and leadership studies. 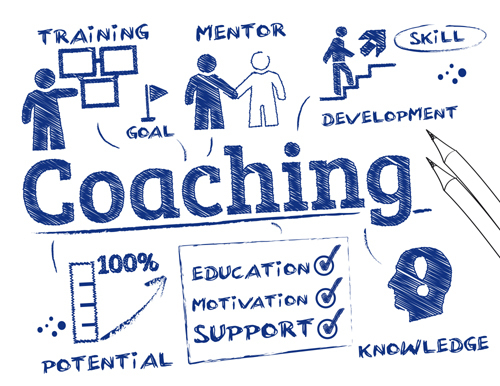 Since the mid-1990s, coaching has developed into a more independent discipline and professional associations such as the Association for Coaching, the International Association of Coaching, the International Coach Federation, and the European Coaching and Mentoring Council have helped develop a set of training standards. The concept of ADHD coaching was first introduced in 1994 by psychiatrists Edward M. Hallowell and John J. Ratey in their book Driven to Distraction. ADHD coaching is a specialized type of life coaching that uses specific techniques designed to assist individuals with attention-deficit hyperactivity disorder. The goal of ADHD coaching is to mitigate the effects of executive function deficit, which is a typical impairment for people with ADHD. Coaches work with clients to help them better manage time, organize, set goals and complete projects. In addition to helping clients understand the impact ADHD has had on their lives, coaches can help clients develop "work-around" strategies to deal with specific challenges, and determine and use individual strengths. Coaches also help clients get a better grasp of what reasonable expectations are for them as individuals, since people with ADHD "brain wiring" often seem to need external mirrors for accurate self-awareness about their potential despite their impairment. Unlike psychologists or psychotherapists, ADHD coaches do not provide any therapy or treatment: their focus is only on daily functioning and behaviour aspects of the disorder. The ultimate goal of ADHD coaching is to help clients develop an "inner coach", a set of self-regulation and reflective planning skills to deal with daily life challenges. A 2010 study from Wayne State University evaluated the effectiveness of ADHD coaching on 110 students with ADHD. The research team concluded that the coaching "was highly effective in helping students improve executive functioning and related skills as measured by the Learning and Study Strategies Inventory (LASSI)." Yet, not every ADHD person needs a coach and not everyone can benefit from using a coach. Business coaching is a type of human resource development. It provides positive support, feedback and advice on an individual or group basis to improve personal effectiveness in the business setting. Business coaching is also called executive coaching,corporate coaching or leadership coaching. Coaches help their clients advance towards specific professional goals. These include career transition, interpersonal and professional communication, performance management, organizational effectiveness, managing career and personal changes, developing executive presence, enhancing strategic thinking, dealing effectively with conflict, and building an effective team within an organization. An industrial organizational psychologist is one example of executive coach. Business coaching is not restricted to external experts or providers. Many organizations expect their senior leaders and middle managers to coach their team members to reach higher levels of performance, increased job satisfaction, personal growth, and career development. Research studies suggest that executive coaching has a positive impact on workplace performance. Christian coaching is common among religious organizations and churches. A Christian coach is not a pastor or counselor (although he may also be qualified in those disciplines), but rather someone who has been professionally trained to address specific coaching goals from a distinctively Christian or biblical perspective. Although various training courses exist, there is no single regulatory body for Christian coaching. Some of the Christian coaching programs are based on the works of Henry Cloud, John Townsend, and John C. Maxwell. Health coaching is becoming recognized as a new way to help individuals "manage" their illnesses and conditions, especially those of a chronic nature. The coach will use special techniques, personal experience, expertise and encouragement to assist the coachee in bringing his/her behavioral changes about, while aiming for lowered health risks and decreased healthcare costs. The National Society of Health Coaches (NSHC) has differentiated the term health coach from wellness coach. According to the NSHC, health coaches are qualified "to guide those with acute or chronic conditions and/or moderate to high health risk", and wellness coaches provide guidance and inspiration "to otherwise 'healthy' individuals who desire to maintain or improve their overall general health status". See also: counseling psychology or related subjects, a life coach does not act as a therapist, counselor, or health care provider, and psychological intervention lies outside the scope of life coaching. Critics see life coaching as akin to psychotherapy but without restrictions, oversight, regulation, or established ethical policies. There are no state regulation or licensing requirements for coaches. Due to lack of oversight and regulation, the vast majority of life and wellness coaches have no formal training or certification. With the growing popularity of coaching, many colleges and universities now offer coach training programs that are accredited by the International Coach Federation (ICF). Some courses offer a life coach certificate after just a few days of training, but such courses, if they are accredited at all, are considered "à la carte" training programs, "which may or may not offer start to finish coach training," according to the ICF. "All-inclusive" training programs accredited by the ICF require a minimum of 125 student contact hours, 10 hours of mentor coaching and a performance evaluation process. This is very little training in comparison to some other helping professionals: for example, licensure as a counseling psychologist in the State of California requires 3,000 hours of supervised professional experience.